Guy Reginald Archer Gaunt (1869-1953) and Ernest Frederick Augustus Gaunt (1865-1940), Admirals, were born in Victoria, sons of William Henry Gaunt and his wife Elizabeth Mary, née Palmer. Their brother Cecil Robert Gaunt served as a senior officer in the British Army and Mary Eliza was their sister. Guy Gaunt was born on 25 May 1869 at Ballarat West. A boarder at Melbourne Grammar in 1881-83, he was intended for the law but pleaded to go to sea, but his father could only afford to send him to HMS Worcester, the training ship for officers of the Merchant Navy. Following his training he entered the Royal Naval Reserve and was rated a Midshipman on 17 December 1886. In October 1895 he joined the RN under the provisions of a Special Order in Council. In February 1896 Guy Gaunt became navigating Lieutenant of the gun vessel Swift, then on the China Station, and took part in operations in the Philippines in 1897. Serving in HMS Porpoise in 1897, he commanded the British Consulate at Apia, Samoa, during a rebel attack, and in subsequent uprisings raised and commanded a native force, dubbed 'Gaunt's Brigade' and was mentioned in dispatches. In June 1901 he was promoted Commander and served in the battleship HMS Vengeance in China during the Russo-Japanese War and later in Cressy and Glory. In 1904 at Hong Kong he married a widow, Mrs Margaret Elizabeth Worthington, daughter of Sir Thomas Wardle. 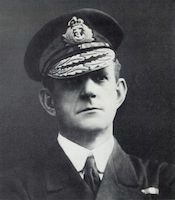 Promoted Captain in 1907, Guy Gaunt commanded the cruiser Andromeda and subsequently the cruisers Niobe and Challenger (on the Australia Station) and the battleships Majestic and Thunderer. In June 1914 he was appointed Naval Attaché in Washington where his success in counteracting the effects of German propaganda in North America brought him to prominence. He was appointed Liaison Officer with the United States Navy on America's entry into the war in April 1917. In 1918 he was employed in convoy service across the Atlantic and in June was appointed to the naval intelligence staff at the Admiralty. He was promoted to Rear Admiral on the retired list in October 1918, Vice Admiral in July 1924 and Admiral in February 1928. Gaunt was appointed a Commander of the Order of St Michael and St George (CMG) in 1916 and a Companion of the Order of the Bath (CB) as well as knighted as a Knight Commander of the Order of St Michael and St George (KCMG), in 1918. He was also elected a younger brother of Trinity House. In 1922 Sir Guy was elected to the House of Commons as Conservative member for the Buckrose Division of Yorkshire but resigned in February 1926. In July he was cited as co-respondent in the divorce case between Sir Richard Cruise and his wife. Sir Guy's wife divorced him in December 1927 and he retired to Tangier where, on 1 December 1932, he married a 35 year old widow, Sybil Victoria Joseph, née Grant-White; they had two daughters. His autobiography, The Yield of the Years, was published in 1940. Sir Guy visited Australia in 1925, 1931-32 and in 1951. He lived at Cobham, Surrey, England, before his death in hospital at nearby Woking on 18 May 1953.